Category Four: Charming Cafés with Great Breakfasts – and More! Category Four and a Half: Fonda El Zaguan! Category Six: Fun Places with Cute Atmosphere and Live Music / Live Theater / Live TV! For information on more of the fabulous restaurants available to food lovers in Todos Santos, please see our other categories including Great Food, Great Chefs, Great Atmosphere; Wonderful Food in a Beautiful Garden Setting snd Killer Local Joints and Taco Stands. All restaurants are presented in alphabetical order within each category. The sample menus shown with each restaurant are literally just a snapshot from our last visit; menu options and prices may naturally evolve over time. Overview: Since 2007 Felix Ramon Vaquez Guluarte has been dishing up all the things that you need to get through the day – and feel good doing it: great coffees (frappucinos, cappucinos, iced lattes and more) tasty baked goods, natural smoothies, hearty breakfasts (all manner of eggs, French toast, waffles – you can choose how badly you want to sin) and delicious lunches. 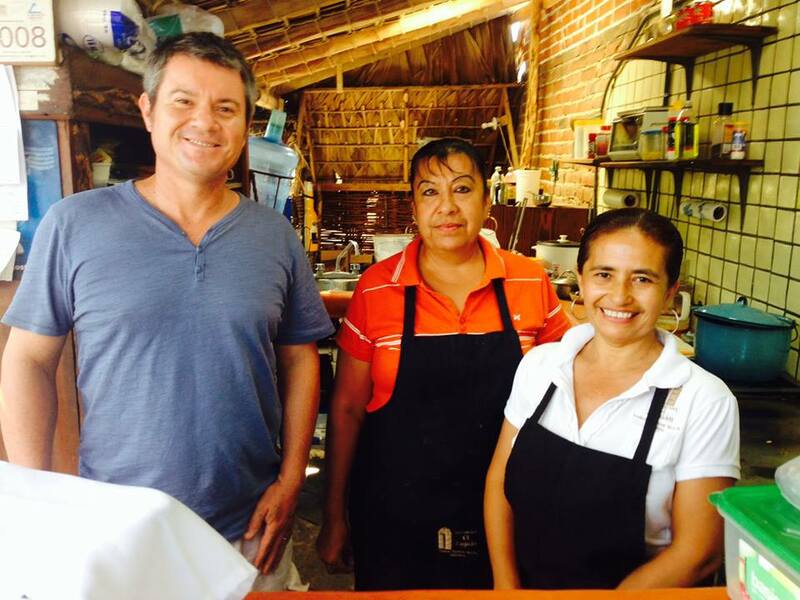 His sidewalk café on the main street of Todos Santos has become something of a gathering point for visitors and locals alike and he works hard to keep the experience fresh for his clientele. He now serves dinner – including wood-fired brick oven pizza on the weekends – at Cafélix, and since 2010 has been serving up great tacos, burritos and hamburgers next door at Boyitacos. He frequently features the work of local artists, sponsors photography contests, and of course shows Mexican soccer matches on the flat screen TV. Very nice, relaxed atmosphere with both inside and outside/sidewalk seating. Free WIFI. Air conditioning in the summer – a rarity! Service: Very friendly and efficient. Rating: Tasty, tasty, tasty! If we need to find one of our guests this is often the first place we look. Hours: Cafélix is open 8:00 AM – 4:00 PM daily, 365 days a year. Boyitacos is open 12:00 Noon – 9:00 PM daily except Tuesdays. Overview: Fresh, large and delicious applies to everything on offer at Caffe Todos Santos. From the wonderful fresh juices, to the dazzling cinnamon buns, from the original inspired salads, to the fabulous fruits of the sea, every dish is a joy for the taste buds and a treat for at least two of you at the table! There are 3 seating area options, each with its own unique ambiance and all thoroughly delightful. There is the sidewalk table option where you can lounge under a canopy of bougainvillea and watch Todos Santos street life roll by; there is the indoor option where you can enjoy the fun collection of posters and objets d’arte (and keep a close eye on the pastries); and there is the garden dining option where you can spread out around large tables framed by a lovely brick wall that gives one the feeling of having stumbled into the private garden of a wealthy entrepreneur – which it once was. Owned by Angelo and Magda Dalbon, who know also operate Tre Galline in the same location. Rating: Charming, fresh, large and delicious! We often bring our groups here for lunch and enjoy hanging out with friends and family here. Hours: 7:00 AM – 9:00 PM Tuesday-Saturday. Sunday 7:00 AM – 5:00 PM and Monday 7:00 AM – 2:00 PM. Category Four and a Half: Fonda El Zaguán! Overview: This tiny spot on the main street of Todos Santos straddles so many of our categories that we finally decided to just put it in a class of its own! 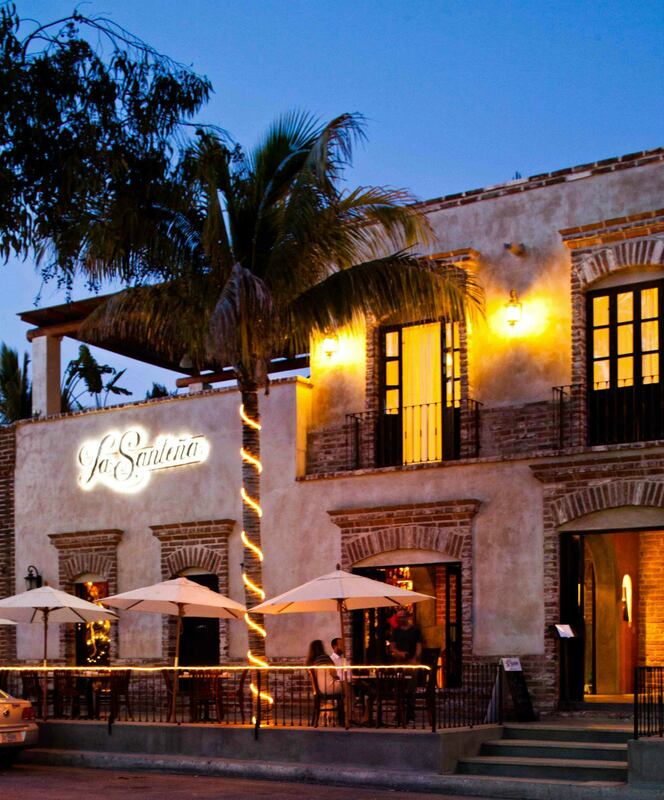 Owned by Erik Castellanos, one of the original developers of Los Adobes, El Zaguán serves some of the freshest, tastiest seafood in town – accompanied by delicious organic salads and a nice selection of wines. El Zaguán is in a very charming, very convenient and vibrant location. There are a couple of tables under a palapa roof on the sidewalk where you can enjoy the ebb and flow of Todos Santos street life while delighting in an El Zaguán creation. Or if you prefer to leave the street behind there are several tables and a small (but full) bar in the streamlined open-air space “inside”. The restaurant’s motto is “Always good, Always fresh” and we’re happy to report truth in advertising here at El Zaguán! Rating: Triple D: Delicious, delectable, delightful! We often bring our groups here for lunch and many of our guests then find their own way back for another meal on their own. Hours: 12:00 Noon – 9:00 PM daily except Sunday. Overview: A fantastic new addition to the Todos Santos food scene that has everyone raving! Owner/chef Rima Lyn thought about calling her place “Waffle ‘n Falafel”, only trouble being that her signature breakfast dish is pancakes, not waffles. But oh what pancakes! Using a recipe that her mother developed “by mistake”, Rima gets her pancakes to fluff up like hot cakes on steroids, then stuffs them with berries and smothers them with cinnamon butter sauce. It’s positively indecent. 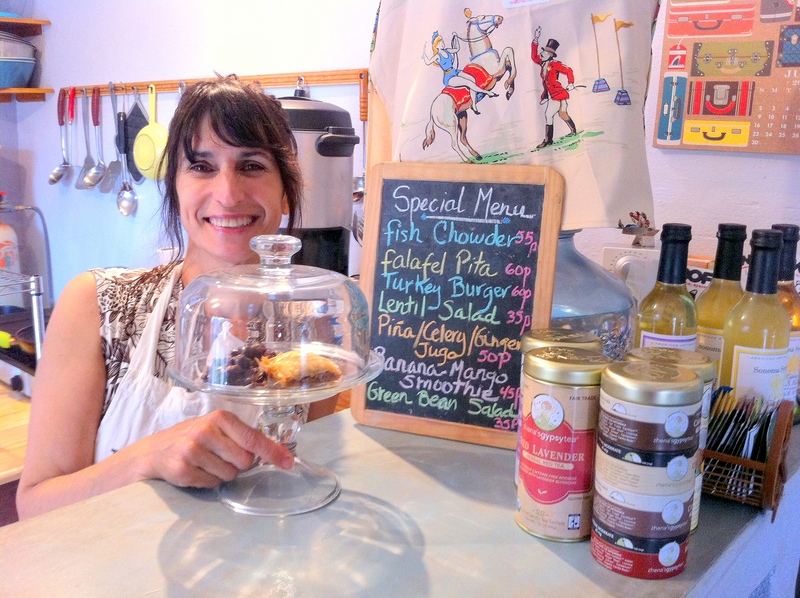 For lunch she always has her awe-inspiring falafel pita on hand, as well as a wonderful array of daily specials such as lentil salad, turkey burgers, fish chowder, celery soup, fruit smoothies and so on – all fabulously fresh and delicious. She invites guests chefs in on a regular basis to prepare special treats for her customers such as crepes or Indian food, and this is always an extremely tasty event. Food is served in the small, homey/funky dining area next to the kitchen that always features the work of local artists, as well as on the sidewalk just outside. Service: Rima and her team love what they’re doing and it shows. They are always delighted to see you, chat about the food – or anything else – and make sure you get the perfect meal you’re looking for. Rating: Yes! Yes! Yes! We’re addicted and you definitely don’t want to miss it while you’re in town. Hours: 10:30 AM – 4:30 PM Tuesday-Saturday. Closed August – October 2014. Overview: Owner/chef Frieda Telemans had three growing boys in the house, which inspired her to focus on the science of nutrition. That was the easy part. The hard part was the art getting teenage boys to not only tolerate healthy food, but love it. She succeeded wildly, and now that the boys are grown and gone, the rest of us get to discover how fantastically delicious Frieda can make disgustingly healthy fare. 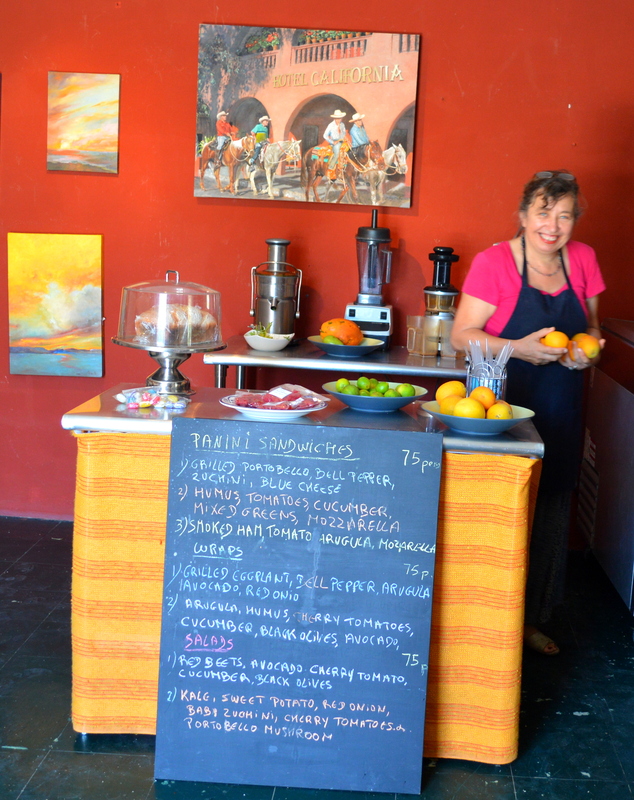 Right inside the art gallery she’s been running for 8 years on the main street of Todos Santos – Galeria Indigo – Frieda offers a simple menu with complex and wonderful flavors that spread joy to your taste buds and arteries alike. The menu features fresh-squeezed fruit and vegetable juices, sandwiches, wraps, salads and espresso. And from the portabello mushroom panini, to the fresh vegetable and hummus “burritos”, to the beet and goat cheese salad, everything is absolutely yummy. Need proof? We took three groups of teenagers there this summer – to a kid they loved it all and asked for more. ‘Nuff said. Service: It’s just Frieda right now and she’s always happy to see you! 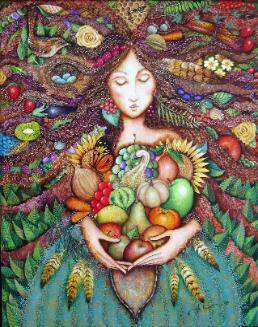 Rating: Winner of the Todos Santos 4-H award – a Heavenly Hip n’ Healthy Humdinger! We love it and now take many of our groups there for lunch. If you want to go with more than 2-3 friends best to call ahead so that she can be prepared for you. Hours: Monday-Saturday, 9-6, Sundays 11-4. 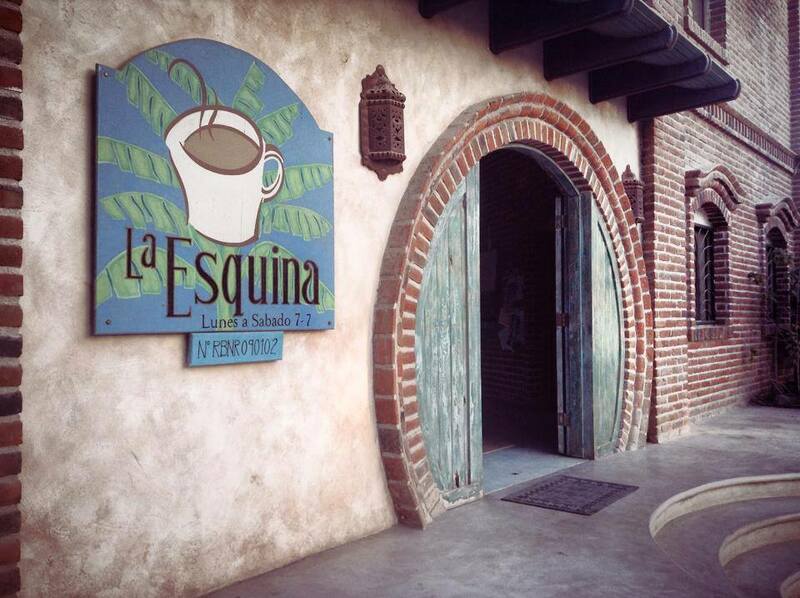 Overview: With its proximity to the more gringo-laden communities of Todos Santos, and its terrific selection of fresh, healthy and tasty fare, La Esquina quickly became a favorite with many residents in town after its opening in 2007. A delightful array of breakfast entrees, fresh-baked goods, and great sandwiches, all of which can be washed down with a good selection of juices, teas, coffees and beers, is served in a charming, open-air space under a large palapa roof. Free WIFI and an area with overstuffed chairs and sofa invite visitors to lounge for a while. Happy Hour from 5-6 PM draws the after-surf / pre-dinner crowds, who can enjoy 2-for-1 beer, wine and margaritas. There is a farmer’s market each Wednesday during the winter. Service: Quite relaxed and nice. Rating: Fresh-n-tasty! It’s a favorite spot for many folks to meet friends and associates – not only because of the good libations, but because many of the tables are set far enough apart that you can have a private conversation. That being said, there is often a convivial group atmosphere about the place. Overview: When you’re craving delicious / fresh / organic / vegetarian food for breakfast or lunch Pura Vida is the place to go! Since 2009 the dynamic husband-and-wife team of fashion designer Joella Corado (Todos Santos born and raised) & Kurtis Parsons (massage therapist and professional percussionist) have featured a refreshingly brief menu of a few items that they do extremely well and that reflect their goal of living an alternative, healthier lifestyle. For lunch you can indulge in pesto quesadillas, vegetable spring rolls, veggie Panini, organic salad, veggie/organic burritos and nachos, and for breakfast there is oatmeal, fruit, granola, chilaquiles, and Spanish eggs. Perfect! Vegan, gluten-free and wheat-free options abound. While it is a health food place there are a couple of (relatively) sinful options, including the delicious chocolate avocado pie and cheeseless cheesecake. Joella and Kurtis also run regular specials like Vegan Lasagna with Zucchini Noodles, Mushrooms, Spinach, Broccoli, and Creamy Cashew cheese. Pura Vida has just a few tables under a palapa roof that also houses a small store with organic / healthy / exotic food items, as well as some of Joella’s Belazul Beach and Active Wear line of clothing and jewelry. Rating: A great gift for your taste buds! We come around for a fix as often as we can. Hours: 8:00 AM – 5:00 PM daily. Summer hours are 11:00 AM – 5:00 PM, closed on Sundays. Overview: Started by long-time Todos Santos residents Isabel Smyth and Raul Cavazos, El Teatro Luna Azul brings the idea of dinner and a movie to a whole new wonderful level. Once in a blue moon, i.e., whenever they feel like it, Isabel and Raul invite the public to their huge, open air theater space where they show fascinating, hard-to find movies ranging from classic to controversial, musical to mystery, altered lives to the altered planet. Prior to some shows – but not all – they serve creative meals featuring seasonal fruits and vegetables fresh from their on-site garden, prepared in their open-air kitchen. Vegetarian options are always available and all options are wonderfully fresh and delicious. The movies are great fun, but they are perhaps more famous for their live theatre productions in which they use local talent to bring comedies, musicals and the performing arts to the community. Isabel and Raul also host full moon drumming and music nights. Rating: Worth howling about! It’s a great gift to the community and always a lot of fun, no matter whether you’re watching a movie at the theater or participating in a drumming circle on the beach. Overview: What? It’s the Hotel California – you have to go at least once while you’re in town. And the good news is that you’ll be glad you did! The restaurant has a truly wonderful atmosphere and reflects the combination of fun, whimsy, magic and practicality that original owners John and Debbie Stewart infused the whole place with back in 2002. And Executive Chef Dany Lamote has made the restaurant a mecca for all comers, with plenty of traditional US / international fare for those who aren’t in the mood for Mexican, and terrific local dishes for those who are. Jalapeño margaritas made with Hotel California Tequila are not to be missed no matter which category you fall into! 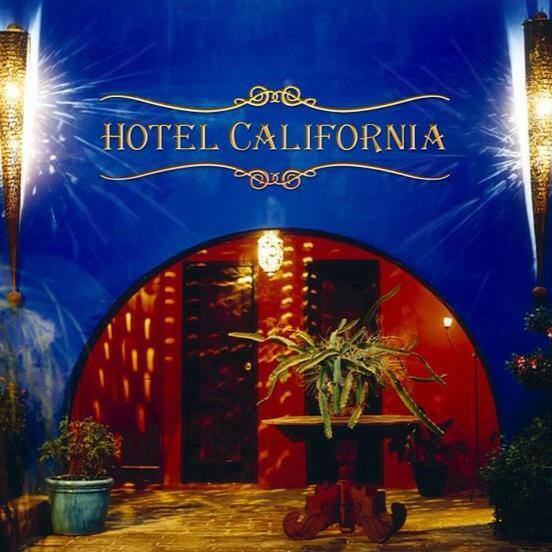 The Hotel California has live music on many weekends, puts on a killer New Year’s Eve program, and is now the venue of the Annual Todos Santos Music Festival organized by Peter Buck of REM. Rating: Too much fun! We begin or end almost every one of our adventure weeks with a meal at the Hotel California. It is always a hit! Hours: 7:00 AM – 9:00 PM daily unless there’s music, when it closes at 11:00 PM. Except on New Years. And some nights of the Music Festival. 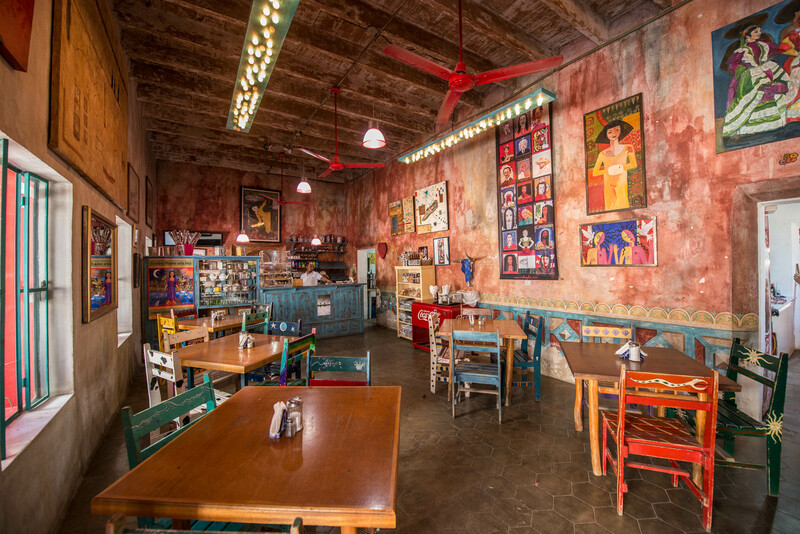 Overview: La Santeña is a cantina-style Mexican restaurant that evokes an earlier time in Mexico. Built by Mexican entrepreneur and builder Miguel Ochoa, La Santeña has a very charming, warm atmosphere created by the brick walls, high, exposed-beam ceiling, copper-plated bar panels and wooden liquor cabinets. Traditional Mexican fare, some American staples, and a full bar are yours for the sampling in either the delightful inside dining area or the very enjoyable and comfortable tables with umbrellas on the sidewalk. La Santeña often features important sporting events on the flat screen TV. Service: Very relaxed and nice. Rating: Very fun! Very nice place to have a meal or a drink with friends. Gallo Azul Pizza Bar. Latin Nights with salsa lessons. A total blast. Guaycura Hotel Sky Lounge Tapas Bar. Live jazz on weekends. Shut Up Frank’s. Sporting events broadcast on TV. This entry was posted on August 22, 2012 by Todos Santos Eco Adventures in Culture, Food, Live Music Todos Santos, Travel Industry and tagged Bistro Magico, Cafelix, Caffe Todos Santos, El Teatro Luna Azul, Fonda El Zuguan, Indigo Cafe, La Coronela at Hotel California, La Esquina, La Santena, Live music Todos Santos, Pizzeria Napoli, Pura Vida Health Food Deli, Todos Santos entertainment, Todos Santos restaurants.